It sure is strange and challenging living in a country where they not only speak a different language but use a completely different alphabet. 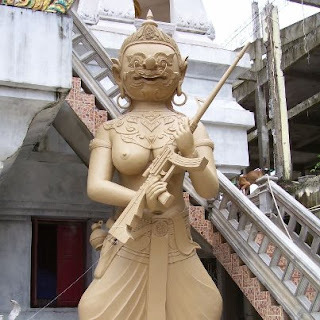 Where the statues at the Buddhist temples carry machine guns. Where road rules are merely guidelines. (I swear a red light means “proceed with caution”). Where false advertising is as common as noodles and rice. Speaking of rice and noodles I love the food here, despite the process of ordering being an entirely hit and miss affair. The non farang menus are simply indecipherable – sometimes it’s just a case of pointing at what someone else is eating and saying I’ll have one of those. I assume they’re machine translations, but I guess I’ll just have to get the guts to order them to find out what they really are. For now I’m just going to stick with pointing at the delicious looking food they have displayed. Meanwhile the Yana de Lys deck replacement is going ahead at a rapid pace. We have stripped the old teak off, and have a small team of locals sanding the old surface ready for the new paint and non slip. Boat Lagoon is a fantastic place to get work done. I still can’t get over the lack of water in the marina though. Before we moved Yana onto the hard stand we spent at least half of our time with 0.0 meters reading on the depth sounder. We were literally parked in the mud. And then the hard stand and the board walks flood at spring high tides. Bizarre.